Manicouagan Reservoir (also Lake Manicouagan) is an annular lake in central Quebec, Canada, covering an area of 1,942 km2 (750 sq mi). The lake island in its centre is known as René-Levasseur Island, and its highest point is Mount Babel. The structure was created 214 (±1) million years ago by the impact of a meteorite of five km (three mi) diameter. The lake and island are clearly seen from space and are sometimes called the "eye of Quebec". The lake has a volume of 137.9 km3 (33.1 cu mi). The reservoir is located in Manicouagan Regional County Municipality in the Côte-Nord region of Quebec, Canada, about 300 km (190 mi) north of the city of Baie-Comeau, although its northernmost part is located in Caniapiscau Regional County Municipality. Quebec Route 389 passes the eastern shore of the lake. The crater is a multiple-ring structure about 100 km (60 mi) across, with the reservoir at its 70 km (40 mi) diameter inner ring being its most prominent feature. It surrounds an inner island plateau called René-Levasseur Island. Mount Babel is the highest peak of the island, at 952 m (3,123 ft) above sea level and 590 m (1,936 ft) above the reservoir level. The Louis-Babel Ecological Reserve makes up the central part of the island. Manicouagan Reservoir lies within the remnant of an ancient eroded impact crater (astrobleme). The crater was formed following the impact of an asteroid with a diameter of five km (three mi), which excavated a crater originally about 100 km (62 mi) wide, although erosion and deposition of sediments have since reduced the visible diameter to about 72 km (45 mi). It is the Earth's sixth-largest confirmed impact crater according to rim-to-rim diameter. Mount Babel is interpreted as the central peak of the crater, formed by post-impact uplift. It is one of the oldest known impact craters. Research has shown that impact melt within the crater has an age of 214 ± 1 million years. As this is 12 ± 2 million years before the end of the Triassic, the impact that produced the crater cannot have been the cause of the Triassic–Jurassic extinction event. 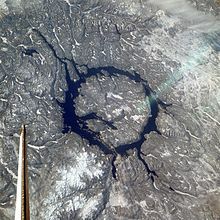 It has been suggested that the Manicouagan crater may have been part of a multiple impact event which also formed the Rochechouart crater in France, Saint Martin crater in Manitoba, Obolon' crater in Ukraine, and Red Wing crater in North Dakota. David Rowley, a geophysicist, with the University of Chicago, working with John Spray of the University of New Brunswick and Simon Kelley of the Open University, discovered that the five craters appeared to form a chain, indicating the breakup and subsequent impact of an asteroid or comet, similar to the well observed string of impacts of Comet Shoemaker–Levy 9 on Jupiter in 1994. 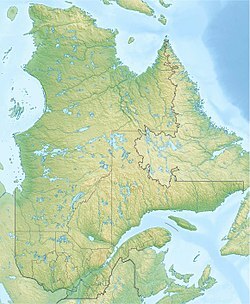 The Manicouagan Reservoir as it presently exists was created in the 1960s, by flooding the earlier Lake Mushalagan (Mouchalagan) to the west of the central plateau and then-smaller Manicouagan to the east, by construction of the Daniel-Johnson Dam. The works were part of the enormous Manicouagan or Manic series of hydroelectric projects undertaken by Hydro-Québec, the provincial electrical utility. 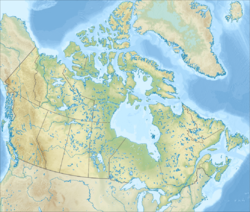 The complex of dams is also called the Manic-Outardes Project because the rivers involved are the Manicouagan and the Outardes. The reservoir acts as a giant headpond for the Manicouagan River, feeding the Jean-Lesage generating station (Manic-2), René-Lévesque generating station (Manic-3), and Daniel-Johnson Dam (Manic-5) generating stations downstream. In the peak period of the winter cold, the lake surface is usually lower, since the turbines run all the time at peak load to meet the huge electrical heating needs of the province. The surface of the lake also experiences low levels in the extreme periods of heat in New England during the summer, since in that period Hydro-Québec sells electrical energy to the joint New England grid and individual utilities in the United States. ^ Briney, Amanda. "The World's Top Ten Largest Reservoirs by Volume". About.com. Retrieved 19 August 2010. ^ "Manicouagan". Earth Impact Database. University of New Brunswick. Retrieved 2009-08-19. ^ "Impact Structures listed by Diameter (Increasing)". PASSC. Retrieved 6 July 2012. ^ Hodych, J.P.; G.R.Dunning (1992). "Did the Manicouagan impact trigger end-of-Triassic mass extinction?". Geology. 20: 51.54. Bibcode:1992Geo....20...51H. doi:10.1130/0091-7613(1992)020<0051:DTMITE>2.3.CO;2. ^ Ramezani, J., S. A. Bowring, M. S. Pringle, F. D. Winslow, III, and E. T. Rasbury (2005). "The Manicouagan impact melt rock: a proposed standard for intercalibration of U-Pb and 40Ar/39Ar isotopic systems". 15th V.M. Goldsmidt Conference Abstract Volume, p. A321. ^ Steele, Diana (19 March 1998). "Crater chain points to impact of fragmented comet". University of Chicago Chronicle. ^ "Manicouagan Impact Structure". Crater Explorer. Retrieved 25 April 2017. Wikimedia Commons has media related to Daniel-Johnson Dam. Rowley, David. "Paleogeographic Atlas Project: Pictures". Paleogeographic Atlas Project. University of Chicago. Archived from the original on 18 June 2007. Retrieved 14 June 2013.